These intermediate readers offer a wealth of material from 18 centuries of Latin literature. The selections are arranged under headings that explore universal human values, and the material has been chosen for its relevance to students of today. Designed to be read rapidly without the intensive work necessary in a regular text. HELP THE STUDENTS PROGRESS FROM ONE LEVEL TO ANOTHER LATIN READINGS: A STUDENT’S PERSPECTIVE by Michelle Wu Perhaps the most difficult stage in a Latin student’s course of study is bridging the gap between grammatical forms and actual reading. I still remember that time in 3rd year Latin when we moved from choosing the correct form of a word and conjugating verbs to translating 38 Latin Stories and then Cicero’s Catilinarian orations. The classroom was filled with frustration, as we grumbled about the confusing word order and bemoaned the seemingly infinite possibilities that exist for each word, shuffling through our charts for reassurance. 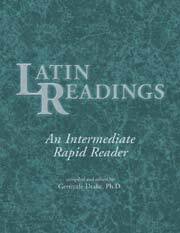 I was recently introduced to Gertrude Drake’s Latin Readings: An Intermediate Rapid Reader, a text that my classmates and I would have greatly appreciated. Drake revives the interlinear method; however, she uses interlinear vocabulary instead of interlinear translation. The original Latin word order is preserved, and only selected words in Latin have a definition or notes right underneath—no footnotes, no word bank, just the text. For me, this would have certainly simplified the process of learning to read Latin, because seeing the English makes it easier to recognize how words fit together. When reading through the text, I found myself instinctively putting together subject and verb in English; it is then a small step to looking for the subject and verb in Latin. Furthermore, the straightforward interlinear text would have prevented the frustration of constantly losing my place in the Latin on account of flipping to the glossary or glancing down at the footnotes after every other word. Having the necessary notes right beneath is an aid to truly focusing on the Latin text. Another source of frustration that would have been relieved by Drake’s text was the difference in learning styles among students in my class. In the book, unfamiliar Latin words are generally defined five times, enlarging vocabulary by repetition of those words in different contexts. Additionally, the interlinear notes change as the text progresses, first helping to untangle word order, but later on, highlighting idioms and implied meanings. And while everyone has the notes available to them, a striped transparency that can cover up these notes is also provided, so that students can go without the vocabulary when they are ready. Moreover, the Teacher’s Manual contains not only translations of the passages, but also comprehension questions that enrich understanding. In addition to all these benefits, the content alone of Latin Readings made me wish that I had used this book. I would have liked having previously read some Cicero or Catullus since that would have made formal study of their works easier, but I would have enjoyed even more some of those other authors’ works that I hear references about but have never had time to even sample, such as Petronius’ Satyricon. Looking through Latin Readings has also been the only exposure I have had to Medieval Latin authors, and I noticed right away that they differ from Classical authors not only in their vocabulary choice and sentence structure, but also in their content. The five Humanistic Topics—The Human Comedy; Loyalty and Love; History and Legendary History; Scientific Insight and Discovery; Education and Philosophy—are represented by Latin authors from 150BC to the 18th century. Truly meant as a “rapid reader,” the book provides a sampling of different styles and topics that prevents students from getting bored, enabling them to read more Latin. I sincerely believe that this intermediate reader, so different from what I used in high school Latin classes, indeed would have made the transition from grammar to reading much smoother for my whole class. While many of my classmates and I struggled through this period and persisted, there were those who were discouraged enough to drop the class. Everyone would have enjoyed the caliber of works featured in Latin Readings, but even more significantly, the accessibility of the interlinear method could possibly have encouraged more of my classmates to keep up the study of Latin. Use Latin Readings for Halloween class, Petronius' Satyricon-Tale of the werewolf.